Are people too stupid to recognize lies and propaganda? In my experience the answer is, hell yes! What the common person believes to be true is often based on the propaganda they believe rather than their own critical thinking in examining the facts. 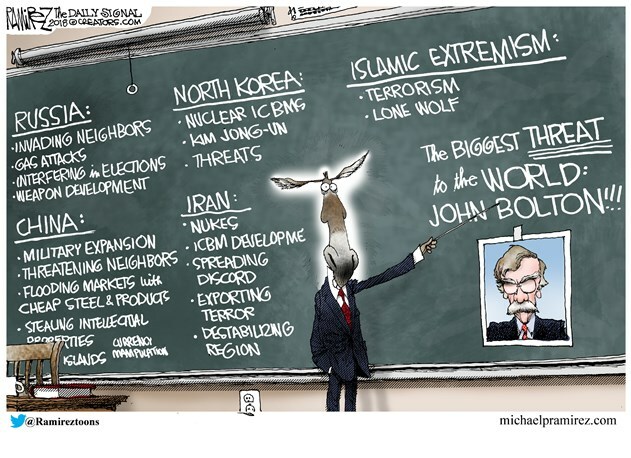 Democrats are telling their lemmings that Trump appointing John Bolton as Secretary of State, replacing Tillerson who didn’t recognize the real threats of Islam and socialism, is more dangerous than the psycho leftist leaders of the world. A little knowledge is a dangerous thing and most people have very little knowledge of what conservatives, moderates, and liberals actually do in Washington politics. The “Resistance” consists of the Democrat Nazi Communist Party members exercising their right to hate America, commit violence and crime, sow discord and chaos, and strive to bring America down so they can institute a socialist dictatorship. Every word they utter is a lie, every narrative they create is a fiction, and anything they say you had better verify from two independent trustworthy sources, not other liberal whackos, before you think about commenting on them and end up looking like a buffoon. The DNC has become rabid in their hatred for America, Trump, Republicans, Christianity, conservatives, and patriots, especially older, white, Christian men like the men who founded America and wrote the Constitution that the Left wants to burn. Liberals deliberately misconstrue and misrepresent what the Right says and believes. Democrats are telling Hillary she should shut up, quit whining about losing, and go away. Hillary deliberately twists this to claim it is Republicans who are telling her to shut up and go away because she is female. This is what leftists do with anything and everything. Nothing they say is to be believed and just a modicum of investigation will reveal their narratives to be false and strictly designed as propaganda to be fed to and swallowed by their lemmings. Liberals arrogantly believe themselves to be intellectuals when they are the antithesis of informed voters. They swallow the stories that Russia hacked the electrical grid in New Hampshire causing a massive power outage and damaging a dam when nothing at all happened. The same with the Hillary dossier that was a fabricated story of Trump hiring prostitutes in Russia. Every story about Russian collusion that declares Trump guilty of stealing the election contains a disclaimer buried in the story stating that there is no evidence or truth to the story, otherwise President Trump could and would sue them for libel. And likewise, they believe the world is going to end from global warming caused by CO2 without understanding any of the science that liberal leftist scientists promote as being factual and scientific. There are even Democrats who still to this day believe Sarah Palin said she can see Russia from her house. They deny they have corrupt operatives in every government agency sabotaging the country in their efforts to make Trump look bad when they have been exposed. This kind of twisting of stories is called “spin” in media lingo. It is how they justify disseminating propaganda based on true facts that they warped into lies.